SoftPlanet makes it possible for everyone to get free Win Toolkit download directly from our servers. There is no registration needed for downloading. Win Toolkit 1.4.43.1 is portable software, which will help you to create your own custom Windows installation. 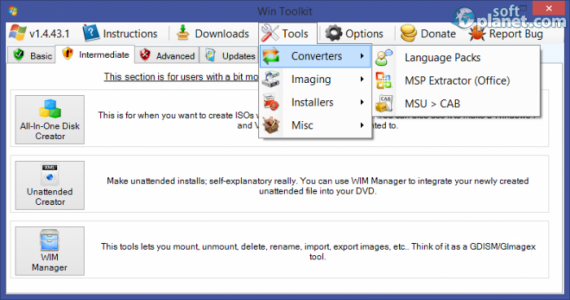 It allows you to integrate various Windows components like add-ons, drivers,gadgets, tweaks, language packs, updates, etc. Actually you can remove features too. 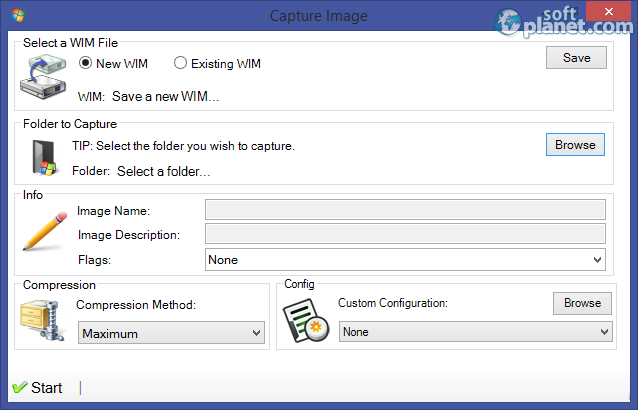 Fortunately, Win Toolkit is 100% free of charge, so “custom” doesn't mean more money any more. 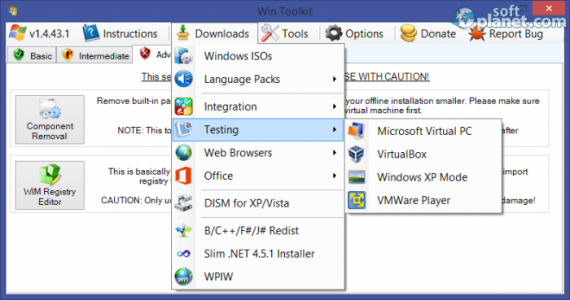 Win Toolkit comes with various tools, which will help you manage your Windows installation in a very simple manner. 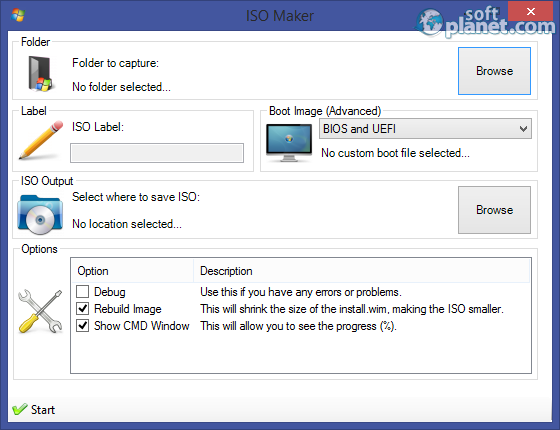 Its toolkit includes an ISO maker, a USB boo preparation tool, a WIM manager, etc. 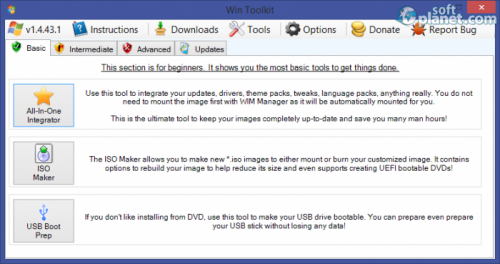 Basically, Win Toolkit will be right next to you during each single step of the customization process. 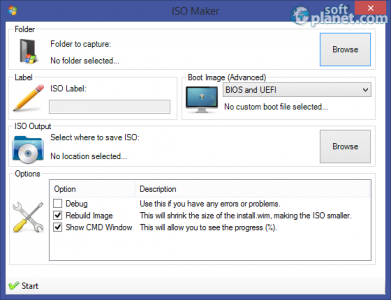 The software comes with a very simple and clear interface. On top you will find all major menus. Right below them, there are four tabs, which includes some basic, intermediate and advanced tools and an an Update section. Its layout is very well-structured, providing you with almost instant access to all available features. Working with Win Toolkit 1.4.43.1 is easy even for a kid. Fortunately, the app offers very extensive guide lines placed within a forum on its website. Thus you can exchange experience with other users, which is extremely useful, especially if you want to create proper Windows installation. Win Toolkit 1.4.43.1 is decent software, which can assist you with creating custom Windows installation. We really liked its forum section, which is really helpful. It contains answers to lots of question regarding the program. Feel free to share you personal experience. Our security scan shows that Win Toolkit is clean from viruses. 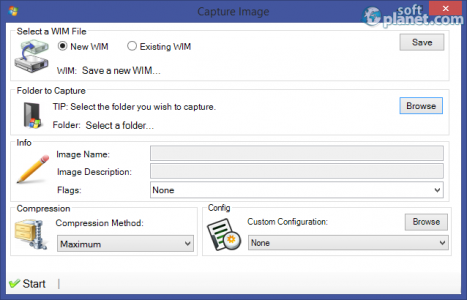 The current version of Win Toolkit has been scanned by our system, which contains 46 different anti-virus algorithms. That ensures that Win Toolkit 1.4.43.1 is 100% safe for your computer.